Ron Struthers of Struthers' Resource Stock Report profiles an up-and-coming solar company that he believes is at the right place at the right time in both Puerto Rico and California. Ten years ago, wind and solar projects were just starting and for the most part required some government incentives or tax breaks. That is no longer the case because like all technology, as it advances, efficiency goes up and prices come down. Solar and wind are now the cheapest sources of new electricity generation. Fossil fuel plants continue to reach end of life, so solar and wind are replacing them. Back in 2007, we bought Western Wind Energyat $1.20. We made very good gains on the stock and it was eventually taken over in a hostile bidding war. Greenbriar Capital Corp. (GRB:TSX.V; GEBRF:OTC) has much the same management team and this go-round I expect we can do magnitudes better. On September 13, 2017, the Department of Energy (DOE) announced that utility-grade solar panels have hit cost targets set for 2020, three years ahead of schedule. Those targets reflect around $1 per watt and 6� per kilowatt-hour in Kansas City, the department's mid-range yardstick for solar panel cost per unit of energy produced (New York is considered the high-cost end, and Phoenix, Arizona, which has much more sunlight than most other major cities in the country, reflects the low-cost end). Those prices don't include an Investment Tax Credit (ITC), which makes solar panels even cheaper. The DOE noted that the cost per watt was assessed in terms of total installed system costs for developers. That means the number is based on "the sales price paid to the installer; therefore, it includes profit in the cost of the hardware," according to a department presentation. According to a November 2017 CBC News article, a new record low price was set for electricity generation and it was neither in a location known for traditional cheap electricity nor from a traditional source. Electrek described it as the cheapest electricity on the planet. It was 1.77 cents per kilowatt hour by Italian multinational ENEL Green Power for a wind farm in Mexico. The previous record low was at 1.79 cents/kWh from solar in Saudi Arabia. Ouch! No wonder the Saudis are selling off the largest oil company (Aramco) in the world. "What makes Greenbriar more compelling than any other public alternate energy company comes down to it being in the right place at the right time." Solar costs are typically less than 3 cents/kWh around the world now, with many under 2 cents, as the industry heads for the 1 cent mark. Is it any wonder the fossil fuel relics are crying and spewing misinformation? As the old adage goes, you can adapt to technological advancement or get run over by it. Everyone has a choice. These are all very strong and positive developments for the alternate energy industry. The price of coal and nuclear is heading off the chart, with gas being the best competitor. Solar and wind can make up about 25% to 30% of the grid before their intermittent nature becomes an issue. 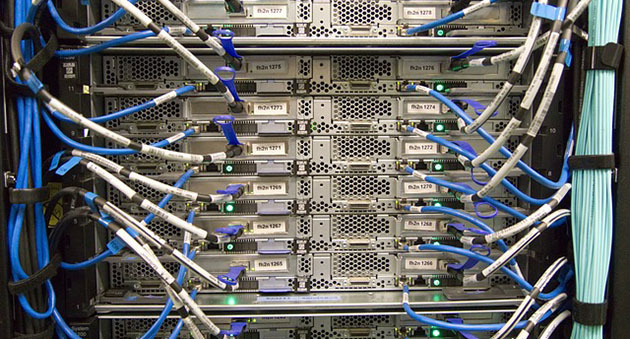 A typical electrical grid will use twice as much power through the day, compared to the night. Solar has an advantage there because its peak time is, of course, during the day when the sun shines. What makes Greenbriar more compelling than any other public alternate energy company comes down to being in the right place at the right time. The solid, experienced management and the great share structure are icing on the cake. Jeff Ciachurski, CEO, launched Greenbriar after a highly successful 11-year career as the founder and CEO of Western Wind Energy, where he built a concept with a few thousand dollars into an industry-recognized, vertically integrated, renewable energy owner and operator. It was sold to Brookfield Renewable Energy Partners for $430 million in March 2013. Mr. Ciachurski established the operating and development assets of Greenbriar in California, Arizona and the Commonwealth of Puerto Rico. Mr. Webb, President, has over 45 years of professional engineering experience. He pioneered utility-scale solar generation as Executive VP of Luz Development, where he led development, permitting and construction of the Luz SEGS units, which until recently was the world's largest combined solar generating facility with over 300 MW capacity. In addition, Mr. Webb has extensive utility experience with Southern California Edison Company where he developed and managed its renewable energy procurement program. Mr. Webb is also a former Division Chief of the Engineering and Environmental Siting Division of the California Energy Commission and was a nuclear adviser to Governor Jerry Brown, including working directly with the governor and representing the State of California at hearings before the Nuclear Regulatory Commission. Daniel Kunz, Chairman, MBA, B.Sc. Eng. has more than 35 years of experience in areas of engineering, management, accounting, finance and operations. 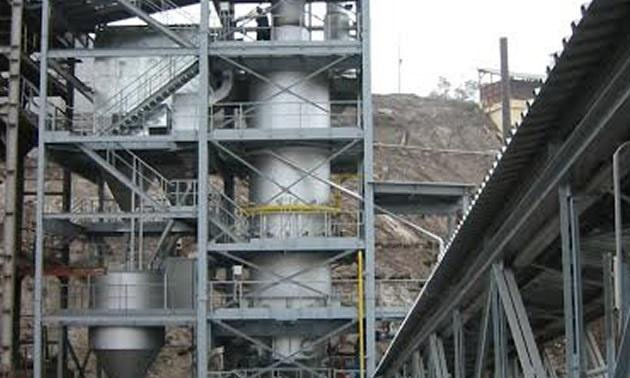 Mr. Kunz was Director, President and COO of Ivanhoe Mines Ltd. (TRQ). In 1998, he led Ivanhoe into Mongolia where and was part of the team that discovered Oyu Tolgoi, one of the largest copper-gold deposits in the world. Mr. Kunz is founder, and from 2004 until April 2013 was President, CEO and Director, of U.S. Geothermal Inc. (HTM:NYSE MKT), a renewable energy company. U.S. Geothermal Inc. developed, owns and operates three geothermal power plants. In 1995, Mr. Kunz was named a Distinguished Alumni from Montana Tech of the University of Montana, and is currently a member of the advisory board for the Engineering Department at Montana Tech, and serves on the board of directors of several public companies involved in natural resource development. You could not find a much stronger and experienced management than what is leading Greenbriar. And with just 17.9 million shares out, considering the assets in the company, it would be much more than icing on the cake for many alternate energy companies. It was not long ago and I am sure most everyone remembers the news of Hurricane Maria last September. It is regarded as the worst natural disaster on record in the Dominica and Puerto Rico. The electrical and communication grids were totally wiped out and to this day are far from being restored back to normal. Just last week, it was reported that on the island of Vieques, off the east coast of Puerto Rico, it may be two years before its undersea cables are restored. Hotels on the southern coast of Vieques only got electrical power mid-March after six months running on generators. In a USA Today article, Col. Jason Kirk, the U.S. Army Corps of Engineers Task Force Power Restoration Commander, commented, "This is of a magnitude beyond anything that's been undertaken in the United States." An associate of mine that I speak with on a regular basis lives on the island, or should I say is coping on the island. I am sure you get the picture of very sad and unbelievable destruction. That is why I say Greenbriar ended up at the right place at the right time. 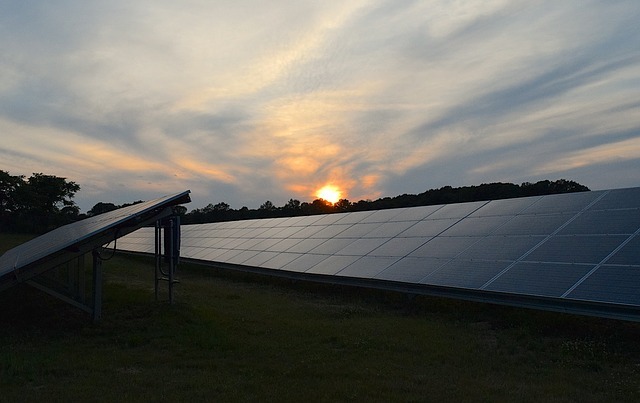 Greenbriar and its predecessor have been on the island for 10 years, long before the credit or weather crisis, and has owned a $1.9 billion solar electrical generation contract for six years. When built at a cost of about $360 million from project level financing, Montalva will add over US$12 million per year to the tax base, create over 1,100 jobs, invest over US$300 million on the island for energy and save the rate payers millions. The U.S. House Committe on Natural Resources is working with Puerto Rico to help identify red tape and other bureaucratic hurdles to speed up the development of power solutions, where Greenbriar's Montalva project would fit in. News out April 3rd solidifies U.S. Congressional support and the project is noted as "project that should be considered a candidate for selection as a Critical Project." This graphic is a map of Puerto Rico showing the electrical grid; the Greenbriar project noted with the arrow is close to connection (red and blue lines). This next graphic is the solar map and the Montalva project is the best location for solar power. The project is in an ideal location area of low cloud cover and rainfall with flat topography requiring minimal site grading. There is an existing PREPA 115 kV line traversing the Guanica site for ease of possible 115 kV on-site interconnection of project. It is located in a coastal plain setting in an area outside of any agriculture reserve with excellent highway access on Hwy 116. The area has low population density and no floodplain/wetlands or actively flowing waterways. This project should have been built years ago, but with the credit crisis, the power purchase contract was not being honored so construction never started. Perhaps this was a good thing as it might have been damaged by the hurricane. Greenbriar has been proceeding in courts for damages in regards to breach of contract. The company has considerable investment in the project. As you would expect, the stock has been getting zero valuation for this in its price. Now it's a brand new ball game. This project is front and center on the political and financial front to go ahead as part of the power restoration effort for the island. Greenbriar has a current market cap of $17 million; what do you think a sudden $1.9 billion project will do for the share price when it gets the green light? For some insight, throughout the 35-year power contract this project will generate US$58 million in annual revenue to Greenbriar. Any positive news on this project going ahead could propel the stock towards $10, which would be a realistic value considering the shares outstanding and revenue. It would require no share dilution so three times revenue equals US$9.60 per share. The solar project alone is a company maker, but its Smart Glass division, could be be another large factor. Glass whose light transmission properties can be altered is called Smart Glass. Using liquid crystal technology, glass can go from clear to opaque or anywhere in between in an instant. According to a February 2018 report by Grand View Research, the global Smart Glass market size was valued at US$2.81 billion in 2016. The research firm notes, "The surging adoption of sustainable solutions in the automotive and architectural sector is driving the industry growth. These products are gaining widespread prominence as end-use industries are recognizing its technical attributes and unique aesthetics. Moreover, the demand for energy-efficient glasses is witnessing a high growth due to policy-driven environmental and energy safety perspective." If you have not seen smart glass in action, this Youtube video is a must see. Simply amazing. Smart Glass has existed for years, but only now has Gauzy perfected the technology to ensure maximum longevity and transparency. With Liquid Crystal Film + Glass = LCG� any glass surface has the ability to switch from opaque (privacy and projection) to transparent (an open feeling) on demand. The liquid crystal segment has low driving voltage; high stability for heat, moisture, and UV; and all-weather conditions from -30 �C to 80 �C from indoor to outdoor for both rear and front projections along with super diffusion, energy savings, and long lifetime. This technology has been deployed for privacy control solutions (in bathroom/shower doors, intensive-care areas, conference rooms) and as provisional projection screens. It can also be used for significant energy savings in warmer climates where the sun's rays can be blocked out. There is no need for the extra cost of window blinds or shades. "It is rare to find a company with such a low amount of shares outstanding and a low valuation compared to the potential value of its assets." Greenbriar's LC Films are powered by patented square wave controllers for premium performance and film preservation. Greenbriar creates LCG� using PDLC (polymer dispersed liquid crystal) with a unique UV curing formulation consisting of four films over the glass: Liquid Crystal Polymer, Initiator, Micro-Spacer and a UV Stabilizer. The current hurdle for Smart Glass in North America is little distribution. If you wanted to install it, there are few sources and what is there is mostly custom-expensive installation or self install kits. Large glass companies are not interested yet, as the technology and market needs to advance further before they would commit to retooling factories. Greenbriar intends to make their glass more widely available with partnerships in manufacturing, distribution and installation. We should watch for developments on that front in the coming weeks and months. The Smart Glass is estimated to sell for between $70 to $120 per square foot and retrofit film for about $50 per square foot, both providing substantial profit margin. When first investigating the company I wondered how real estate and blockchain fit into the company. It seemed off track for an alternate energy or green company. What I learned was another case of being in the right place at the right time, some conscious effort and luck. CEO Jeff Ciachurski is one of the most conscientious CEOs when it comes to preserving shareholder value that you can find in any public company. When Greenbriar started in its infancy on the TSX Venture, it bought a real estate asset for its qualifying transaction as a public company. Jeff believed real estate offered great value as the economy was coming off the 2007/08 crash and, more importantly, it would not require any share dilution for development, exploration work, drilling, etc., that you find with many resource start-up companies. At the time Greenbriar paid US$1 million for this asset and it is now worth about $5 million. Greenbriar's asset consists of 161 acres in Tehachapi, California, the fair raw land value of which has been appraised at US$4,600,000 (as at July 18, 2017). There is currently a letter of intent (pending approval) to sell a 50% interest in 132 acres of that parcel of that land for a purchase price of $2,250,000, payable by way of a combination of cash and shares in the corporate purchaser. The figures above reflect the raw land value but, if developed into town homes, the property would yield the company $260 million over seven years. You can easily see above that Greenbriar's land package is being surrounded by development. In real estate it is location, location, location, and Greenbriar has that. There is a Walmart Super Center being developed nearby and the land package is about 20 km from Elon Musk's SpaceX. It is also not far from Northrop Grumman's plant to build the new B-21 stealth bombers. The plant will increase employment to over 5,000. When it comes to real estate, Blockchain technology could play a vital role, especially with title search and registration in the U.S. It seems to be a much more complex problem there compared to Canada and it is not uncommon for buyers to purchase Title Insurance. Greenbriar has launched a wholly owned independent subsidiary company called Realblock, a first of its kind functional real estate blockchain enterprise. The company will unleash the key attributes of blockchain on the transaction-heavy real estate industry, not as an academic exercise, but as a real-time solution to the entire real estate market. Blockchain allows for a faster, safer and cheaper real estate transaction and Realblock will be leading this change. Realblock is partnering with top title insurance and escrow companies, and with the founder of the Blockchain lab at Arizona State University. Proprietary software will streamline and decrease the costs of the escrow and title insurance process, a byzantine paper-heavy and rubber stamp process that has seen little change in decades. Greenbriar has unique insight and experience in this market through director Michael Boyd, who will head up Realblock. He served as chairman of the Pima County Board of Supervisors and was also County Recorder. Mr. Boyd has first-hand knowledge that real estate records and transactions in the United States are very outdated, unreliable and byzantine in their current implementation. This opportunity would probably not be possible if it were not for Mr. Boyd's 30-year relationship with First American, a leader in title search and insurance. Greenbriar's real estate holdings could start returning cash to the company coffers this year sometime to the tune of $4 million and upwards. Realblock will take some time to develop and we are most likely looking at 2019 to 2020 before it starts generating returns. The company also has a 50% interest (with the ability to increase to 100% interest) in the 80-Megawatt Blue Mountain, Utah, Wind Energy Project. Construction was started in 2013 but has been delayed by various third-party appeals to the Utah Public Service Commission. I am not considering this project in the current or near-term value of the company. Any positive progress would be a bonus. At December 31, 2016, the company had little cash on hand. On March 2nd 2018, Greenbriar closed a $827,000 financing at $1.03 per share that will provide ample operating cash for 2018. The company has loans outstanding of $1.45 million and these are all with insiders of the company. About $688,000 of that is with CEO Jeff Ciachurski, who has never taken a salary in his nine years running the company. This speaks volumes towards his commitment to the company and shareholders. I believe the company has adequate financial resources as I expect one or two liquidity events in 2018 with the Puerto Rico solar project and California real estate. It is rare to find a company with such a low amount of shares outstanding and a low valuation compared to the potential value of its assets. The low amount of shares speaks volumes about management protecting shareholder value and fiercely rejecting dilution. At an even $1.00, the company is being valued at only $18 million. The annual projected revenue from the Montalva solar project at US$58 million is four times the current valuation. I expect the Puerto Rico Montalva project to get the green light sometime this year. As indicated today, Greenbriar has been working closing with Congress to move Montalva forward. What is more, Montalva will generate electricity at considerable savings compared to the current oil generation to the tune of $35 million per annum. I also expect a sales agreement on the company's California real estate in 2018. Either of these would give a significant revaluation to the stock price, Montalva in particular but just as much so if the real estate project went the way of a housing development project instead of an outright land sale. With a green light in Puerto Rico this year, we could assume revenue in 2019 and assuming just a straight C$5 million sales of the company's California real estate, a fair value would be about $75.5 million. Lets us assume zero valuation for the Smart Glass and Realblock divisions to be ultra conservative. Montalva and California would require no share dilution, but I will round up to 20 million shares. $75.5M / 20M = $3.77 price. This represents a very conservative target for 2019 and even at that we are looking at 300% return. It would not surprise me to see this share price in the coming months just based on positive news as the stock is so undervalued at its current price. 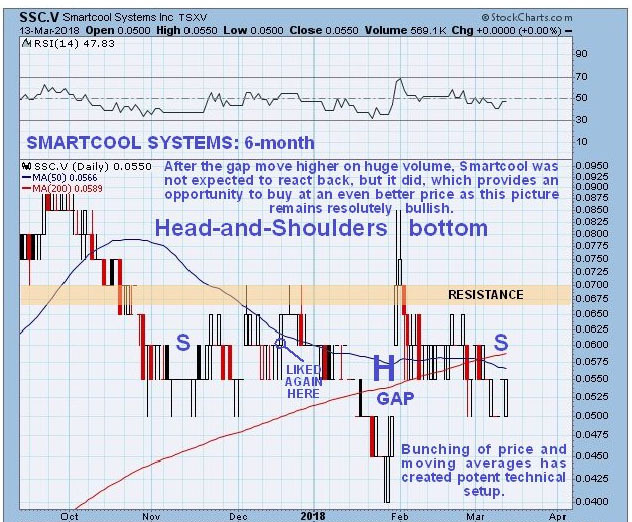 Add some value for success with the Smart Glass and Realblock divisions, and a ten-bagger with this stock is not a long stretch. The obvious observation from this chart is the low trading volume. The stock is tightly and well held. Most of the weakness that resulted in the lows in 2016 was because of two estate sales. When this stock is discovered, just modest volume will cause a rise in price. The downtrend line was broken in 2016 and a new uptrend is underway. The stock is now at the bottom of the up trend channel and a real steal here. Resistance is around $1.60 and with current fundamentals I consider it a strong buy up to that price. There is a good video and overview on BNN with GRB CEO Jeff Ciachurski starting at about 6:18 into the program. This was November 2017, so not that long ago. One of the key points Jeff makes in this video is that Smart Glass is in its infancy and I agree. I have no doubt that within 10 years it will be mainstream and all vehicles on the road will have it, as will many buildings and homes. There is also a retrofit solution where the Smart Glass film could be applied to existing glass. 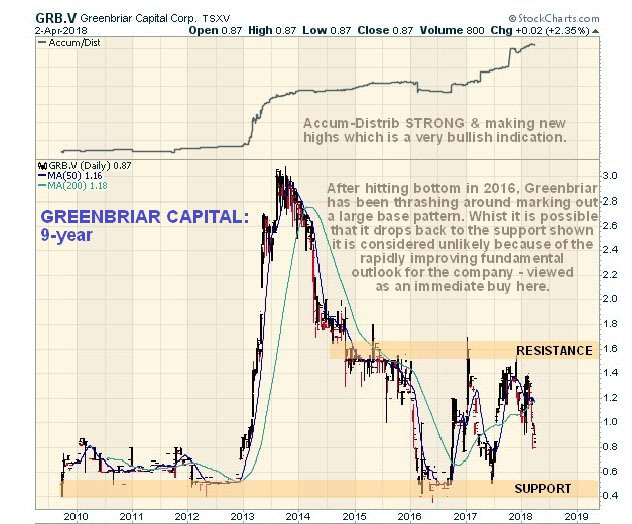 Greenbriar expects $30 million in revenue within two years in this sector, and again I have given that no consideration to my share price projection. Click here to read Clive Maund's analysis of Greenbriar Energy. For 27 years, Ron Struthers, founder and editor of Struthers' Resource Stock Report and Playstocks.net, has consistently beat the comparable benchmarks selecting stocks in the precious metals, oil and gas, clean-tech and disruptive technology sectors. In 2017, 35 stocks in the precious metals sector saw an average gain of 62% and energy clean-tech an average gain of 65%. In disruptive technology, 16 picks saw an average gain of 55%. Past performance is no guarantee of future gains. Struthers leverages his vast network of contacts, approaches investments from a value perspective seeking several 100% gain potential and uses technical analysis to aid in buy and sell levels. 1) Ron Struthers: I, or members of my immediate household or family, own shares of the following companies mentioned in this article: Greenbriar Capital. I personally am, or members of my immediate household or family are, paid by the following companies mentioned in this article: None. My company has a financial relationship with the following companies mentioned in this article: Greenbriar Capital is an advertiser on Playstocks.net. I determined which companies would be included in this article based on my research and understanding of the sector. 2) The following companies mentioned in this article are billboard sponsors of Streetwise Reports: Greenbriar Capital. Click here for important disclosures about sponsor fees. As of the date of this article, an affiliate of Streetwise Reports has a consulting relationship with Greenbriar Capital. Technical analyst Clive Maund profiles a company with a solar project in Puerto Rico that has just received key Congressional support. Technical analyst Clive Maund charts this energy storage solution company that he believes is ready to rally. 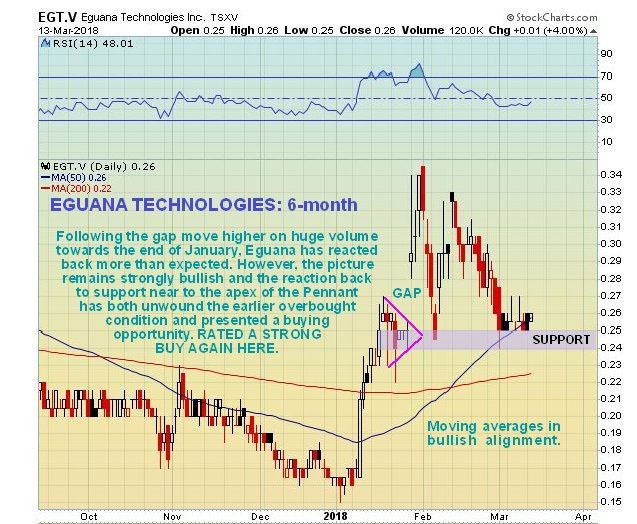 Technical analyst Clive Maund explains why he believes the outlook looks favorable for this energy efficiency company that just announced a merger. 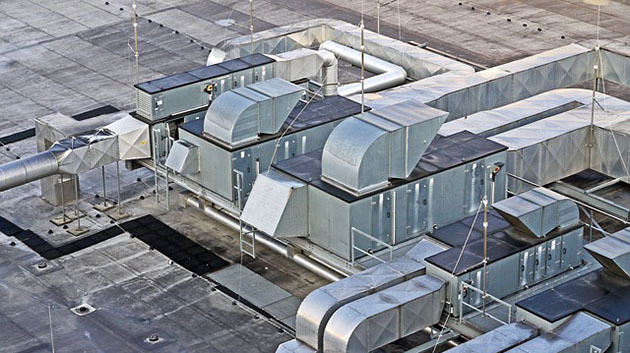 A unique energy efficiency company whose client base runs from a Premier League football stadium to fast food outlets in the Middle East to a data center in the UK is joining forces with a company that brings a unique suite of energy efficiency solutions. Analysts assess the move by this company to acquire a royalty on a project that one calls "one of the largest undeveloped nickel reserves and the largest undeveloped cobalt reserve globally." The annual AlphaNorth Capital Conference features small-cap non-resource companies with high growth prospects. AlphaNorth's founder and chief investment officer, Steve Palmer, profiles several companies that he believes have bright prospects. The Critical Investor sits down with MGX Minerals CEO Jared Lazerson for updates on this multi-faceted company. Following the successful installation of this company's energy saving technology in a data center, the company is focusing on the energy-intensive industries of cryptocurrency, blockchain and cannabis cultivation. 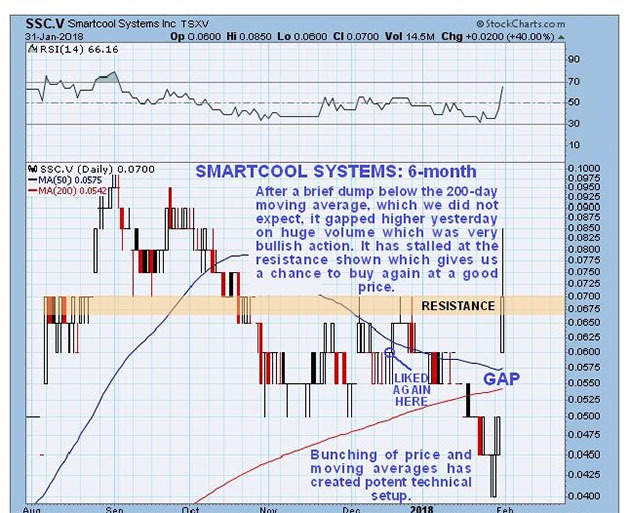 Technical analyst Clive Maund charts a company with energy efficiency and energy reduction solutions that is targeting the cryptocurrency, bitcoin and cannabis industries. 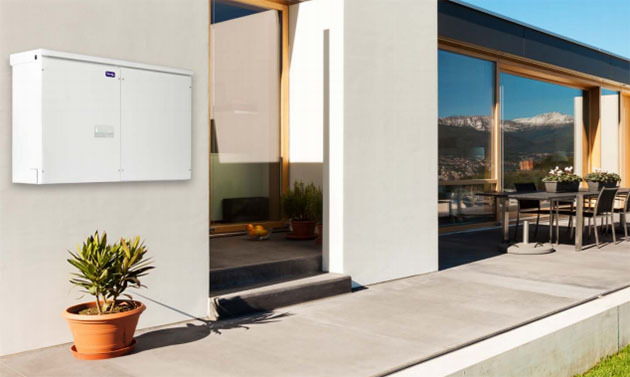 A multiyear agreement with a German automotive company for residential AC battery systems catapults this company to a new level.